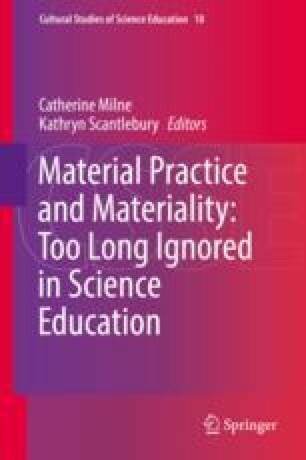 In this chapter we explore how the materials at hand mediated what occurred in intra-action within young children’s science investigations. We draw on post-human theoretical perspectives, notions of materialism (Hultman K, Lenz Taguchi H, Int J Qual Stud Educ 23(5):525-542, 2010) and agential realism (Barad K, Signs 28(3):801–831, 2003) to decentre the human and examine agency in human and non-human relations. As we focus on generative relationships in science investigations, Barad’s approaches of entanglement and diffraction provide a lens to consider how bodies (human and non-human) become in and through intra-action. In this manuscript, we consider and focus on the intra-actions between one human and one non-human body within a kindergarten group science activity to gain understandings of how the bodies cause action and in this process become for one another in order to arrive at implications for science praxis at the early childhood level.